SALT LAKE CITY, Aug. 21, 2017 /PRNewswire/ -- The USANA True Health Foundation (THF), whose mission is to ensure that impoverished children and families reach their fullest potential by providing food and nutrition, is pleased to announce that throughout USANA's International Convention, over 1,057,776 meals were raised. The annual event was held in downtown Salt Lake CityAugust 16 – 19, 2017. "We are thrilled to announce our record-breaking fundraising efforts during our International Convention," said Brian Paul, executive director of communications for the USANA True Health Foundation. "As USANA continues to grow, so do our humanitarian efforts and goals and this year was no exception. Our goal was to raise 500,000 over a four-day period, but we raised over a million, thanks to our generous and talented Associates, employees and executives who continually contribute their time and resources to helping serve those in need." 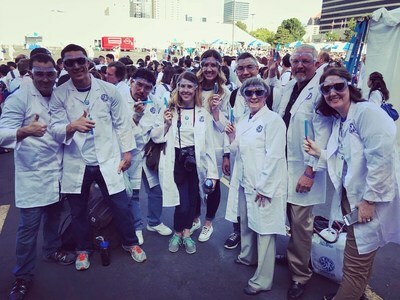 On Wednesday, August 16th, over 4000 USANA distributors and general public gathered together to break the world record of the Largest Gathering of People Dressed as Scientists. Through scientist kit purchases and other donations, a total of 239,937 meals were raised. Real-life superheroes filled the streets of downtown Salt Lake City on Saturday, August 19th for the annual USANA Champions for Change 5K – hosted by Dr. Mehmet Oz – the influential doctor and Emmy-award winning television host whose charity matches his celebrity. Dr. Oz ran alongside 3000 participants where the total donations garnered over $73,000 for THF. Throughout the four-day Convention, thousands of USANA Associates, employees and executives, participated in the Food Pak project, assembling more than 159,000 meals for the Children's Hunger Fund (CHF). A total of 3316 boxes were packed, each containing 20 pounds of staple foods, designed to supplement a family of five for one week. During a VIP Food Pak event, Dr. Mehmet Oz, Erin Oprea (USANA Fitness Ambassador and celebrity trainer), Ashley Jones (The Young and The Restless), and TEAM USANA athletes Devin Logan, Austin Trout, Tim Bradley, Chris Mazdzer and Allison Pineau joined USANA Founder Dr. Myron Wentz and CEO Kevin Guest to assemble the final boxes. To learn more about the USANA True Health Foundation or to make a donation, please visit: www.usanafoundation.org. The USANA True Health Foundation is a registered 501(c)(3) nonprofit organization created by USANA Health Sciences (NYSE: USNA) to help expand and enhance USANA's ongoing charitable efforts. Its mission is to ensure that impoverished children and families reach their fullest potential by providing food and nutrition. The USANA True Health Foundation has an active partnership with organizations such as HealthCorps and the Children's Hunger Fund, which share the same vision of making the world a happier and healthier place. Learn more at our website (www.USANAfoundation.org), follow us on Twitter (@USANAfoundation), or like us on Facebook (www.facebook.com/USANAfoundation).